I am amazed when I remember that we first created the SM-Mobile App more than 3 years ago. It doesn’t feel like it’s really been around for that long, as the development of the app has been so rapid and many features have been added to the first prototype we created back in 2013. The first version of the app was very basic and pretty much all a user could do was to log in and look at their jobs. 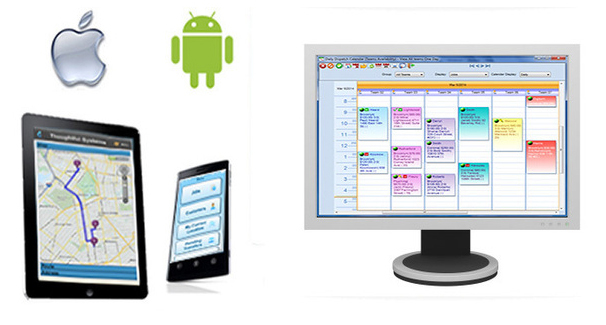 Since that time, we have been rapidly evolving the Mobile App to create a full feature-rich mobile application and a powerful add-on to the main Scheduling Manager program. Businesses everywhere are increasingly gravitating towards the use of mobile devices in the field, and this is reflected in the number of requests for customizations and additions to the Mobile App we are currently receiving from our customers. Especially over the last year, I see how many businesses are finally realizing all the benefits of going mobile. As we realized the need of our Scheduling Manager users for mobile functionality, we continued to add new features and capabilities to the Mobile app to meet their growing demands. Administrators can view employees’ GPS coordinates throughout the day and respond in real time. Using the app on their mobile devices, employees can now take pictures, create invoices and record receiving payments, process credit cards, collect customer signatures, record their start and stop times, get directions, record chemicals used and collect customer signatures on waivers. We have also added a wide array of options for configuring the Mobile App to the specific needs of your business. Many mobile devices allow you to specify what information is visible to the employees by letting you choose from more than 100 customizable fields to be displayed on their screens. 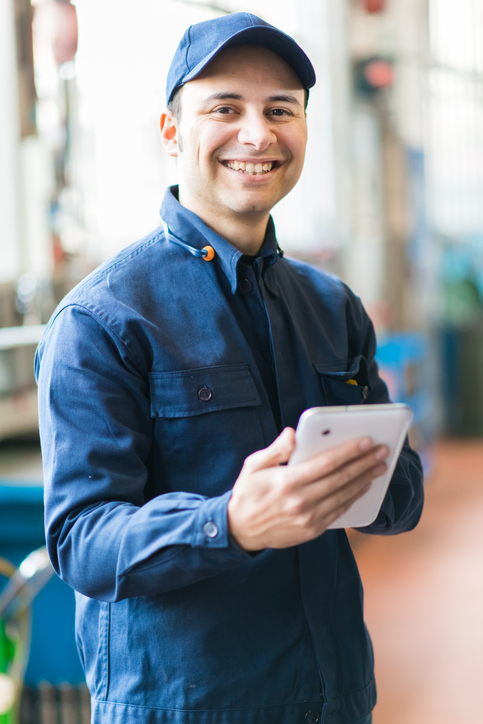 One of the most recent additions to the Mobile App, the ability to attach fillable-PDF forms, is a powerful feature useful for any field service business. Instead of filling out forms by hand, now employees can fill out those forms electronically, using their phone or tablet. With the rise of apps like the SM- Mobile App, there is also a flood of available mobile devices for running these useful applications. All this is relatively new territory for users and application developers. It’s taken a while for business owners and their employees to feel comfortable enough with smartphones and tablets, as well as for business owners to feel comfortable with employees using them. We frequently receive questions from our users asking our recommendation for the best mobile devices to use. There is nothing like real life experience to see how these devices and applications are working in the field. So, I decided to reach out to some of our users who have been using the Mobile App for a while to ask them to share their experiences with the devices they’ve tried it on. Apple devices have been receiving very positive reviews from our current Mobile App users. In particular, the iPad Mini provides a nice smooth experience with the SM-Mobile App and with reliable transfer of information to the cloud. Of course, the drawback is that the iPads come with a hefty price tag (starting at $399 for the iPad Mini 4). if you open a PDF in Adobe Acrobat Reader on your Apple device, you are not able to save it just anywhere you want. You are restricted to saving it in one of the location options specified to you by the app, like you would with files saved in Dropbox or Google Drive. After much deliberation, our brilliant developers were able to find a creative solution to this problem. However, personally, it left me thinking that I don’t like devices dictating to me where I should save files. Another user spoke of their initial experience with the SM-Mobile App after purchasing Ellipsis tablets from Verizon for all their employees. Ultimately, they found that the low price-tag ($149 each) was not worth all the shortcomings of the tablet. The biggest problem with the Ellipsis is speed – they are very slow. They later upgraded to LG 7” tablets, which range in price from $100 up to around $350, depending on whether the device is refurbished or unlocked. These users are currently very happy with the performance of the SM-Mobile App on the LG tablets. Yet another user provided employees with Samsung Galaxy Note 5 phones – that’s the slightly older version before the Galaxy Note 7 notorious for catching fire and exploding. Although it is a mobile phone, the Galaxy Note 5 has a large screen, making it ideal for running a productivity app like the SM-Mobile App. Although there is less room than on a tablet, the screens are big enough for viewing and editing information and it has the added convenience of fitting in your pocket (OK, you’d need a pretty big pocket), with a price tag of around $250 for a good-as-new refurbished device. The Huawei Media Pad M3 is a sleek, new Android device similar in size, look and shape to the iPad Mini. But, with a price-tag of $299, it will make a much smaller dent in your wallet. We recently took the tablet for a test-drive with the SM-Mobile App and were pleasantly surprised by the speed and smoothness of the ride. While some devices with similar operating power are slow and sluggish, the Media Pad responded nicely to taps and screen-opens. We also tested some of the newer features of the Mobile App, such as enabling PDFs to be opened and filled in using Adobe Acrobat and Xodo, and these performed smoothly as well. Company Devices or Employee Devices? Beyond the dizzying array of devices out there, another important question to consider is whether to purchase devices for employees to use, or allow them to use their own devices. In part, the answer depends on several important factors, such as how many employees you have, the type of business you are running and what your employees need to do on the Mobile App. For some businesses, such as maid services, their employees primarily use the app to look up their schedules, record their times and whether they collected a payment from the customer. All this is quite easy to perform on a smaller screen. Moreover, this is the kind of business where you might have a higher turnover of employees or employees who haven’t been with your company for long and you may be hesitant to provide them with a company device, which may get lost or broken. Another issue to consider is whether you want to encourage your employees to use their own phones for more than a bit of texting they are probably already doing on the job. Other types of businesses would make use of other additional features of the app. For example, it is possible to create your own forms or to have employees edit floor plans right in the mobile app. For these types of uses having a bigger screen, like a tablet, is useful. These are also the types of businesses more likely to have a supervisor in charge on site and he or she would be the one actually using the app. In this case, providing employees with a company device can be ideal. It also ensures that everyone is using the same device, which makes troubleshooting much easier. Overall, it seems that most of our users opt for having company devices that remain at the head office, which employees take with them when they leave to start their jobs for the day. As far as having a connection to the internet goes with these devices, the preference varies. Some users find they do not need a constant internet connection and are happy to wait to retrieve data back from the devices until they are able to access a WiFi network. Other users have found that they can effectively ensure their devices always have a WiFi network by tethering them to employee phones (making employees phones into hot spots).